Vicki and I were blessed to be able to slip away for a couple of weeks. We went to Maui and went into island mode. We were able to visit with some friends, relax on the beach and just renew our spirits. We drove to Keanae to visit at the campgrounds where a group of folks from Pampa had gone to do some work. Of course we visited at Kihei Baptist Chapel where we attend while on Maui. I was able to sit down with the pastor to visit and pray together. All in all we had a great time and truly enjoyed our time there. It truly is a beautiful place and a place that I have grown to love over the years. But as with any trip there is always the return home. We left out of Kahului at 7:00 p.m. Hawaii time which was 11:00 p.m. central time. We landed at DFW around 5:30 a.m.
Then we had to catch the connecting flight to OKC. As we got off there was a man that had a sheet telling where the connecting flights were. Vicki asked about our flight to OKC and he told us it was at B39. We headed up to catch the tram and get to our gate. When we got there we looked up on the board and found it said our flight was going out of D10. We headed back to the tram to go to D10. When we got there none of the attendants were at the gate. A couple was standing there looking at their phone. They looked at us and said that the flight had been changed to B39! We headed up to the tram and back to B39. I’m telling you that at 6:00 a.m., I just didn’t feel like riding the tram all over DFW trying to find the right gate! Finally I found someone and asked them for sure what gate we would be flying out of to OKC. They assured me that it was B39. So we found it, sat down and waited. As I thought about this, it brought something to my mind that I want to share with you. I don’t want you to be confused about how one can step into the presence of God and have eternal life. I don’t want you running around from ‘gate to gate’, thought to thought or church to church, trying to find the answer. The truth is found in Scripture. Before Jesus was crucified, He sought to prepare the disciples for what lay ahead. In John 14:1-6, Jesus said -- 1 “Do not let your heart be troubled; believe in God, believe also in Me. 2 In My Father’s house are many dwelling places; if it were not so, I would have told you; for I go to prepare a place for you. 3 If I go and prepare a place for you, I will come again and receive you to Myself, that where I am, there you may be also. 4 And you know the way where I am going.” 5 Thomas said to Him, “Lord, we do not know where You are going, how do we know the way?” 6 Jesus said to him, “I am the Way, and the Truth, and the Life; no one comes to the Father but through Me. 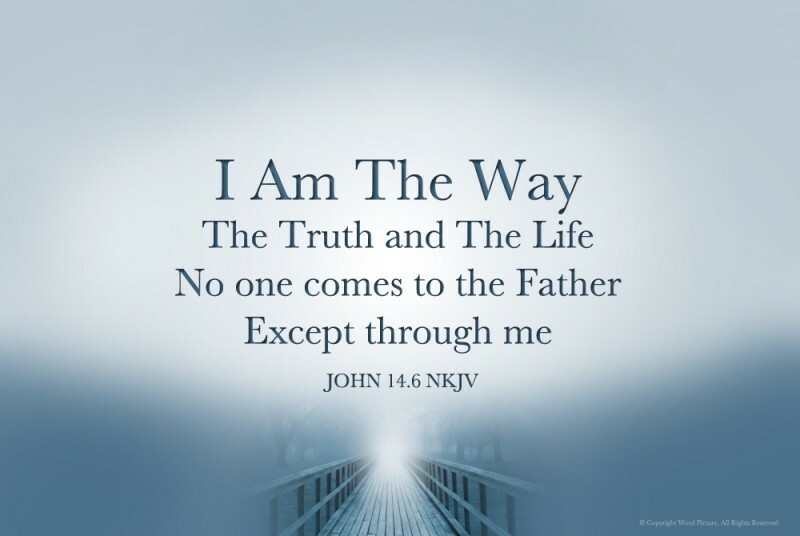 Jesus made it abundantly clear that He was the only way one will see the Father. Romans 10:9-10 says – 9 that if you confess with your mouth Jesus as Lord, and believe in your heart that God raised Him from the dead, you shall be saved; 10 for with the heart man believes, resulting in righteousness, and with the mouth he confesses, resulting in salvation.” Believe in Him and confess Him as Lord. In Acts 4 Peter and John were arrested for healing the lame beggar and preaching the truth of Christ, the rulers, elders and scribes confronted them about what they had been preaching. It was then that Peter was filled with Holy Spirit and shared with them. I just love that! Peter said ‘there is no other name under heaven that has been given among men by which we must be saved.’ He wanted them to know that Jesus is the ‘narrow gate/way that leads to life’ (see Mt.7:13-14). So when you are trying to find your way home to the love of God, don’t run from one gate to the other. Go to the gate that leads to life! His name is Jesus!